Nice italics, bad #Eszett: My tweets about the 2015 Typodarium | Isoglosse. Even if you knew nothing about the typefaces featured in the Typodarium, the cloud would give you a certain idea of the distribution of the different categories: ‘Sans’, for example, is much larger than any of the terms that are used to designate typefaces with serifs (and ‘Sans Serif’ is indeed one of the largest categories, as we have seen in the diagram here). ‘Script’ – not one of the three largest typeface categories – is surprisingly frequent (and we have to add ‘handwriting’, which is appropriately placed just below ‘Script’). This may be a hint that the categorisation in the calendar itself does not provide the full picture and that there are some script typefaces hiding in other categories. (The term ‘script’ can also be used to mean ‘writing system’, rather than ‘typeface emulating handwriting’, but I did not use it in this sense more than once or twice.) We get the same hint from the large size of ‘Geometric’, which is a small category in the diagram. In any case, it seems that letters based on simple geometric shapes and letters based on chirography are going strong among the typefaces featured in the 2015 Typodarium. My tweets were supposed to be micro-reviews (although I am aware of the fact that you cannot properly review a typeface before having used it), but I ended up describing the typefaces I was reviewing more often than not. 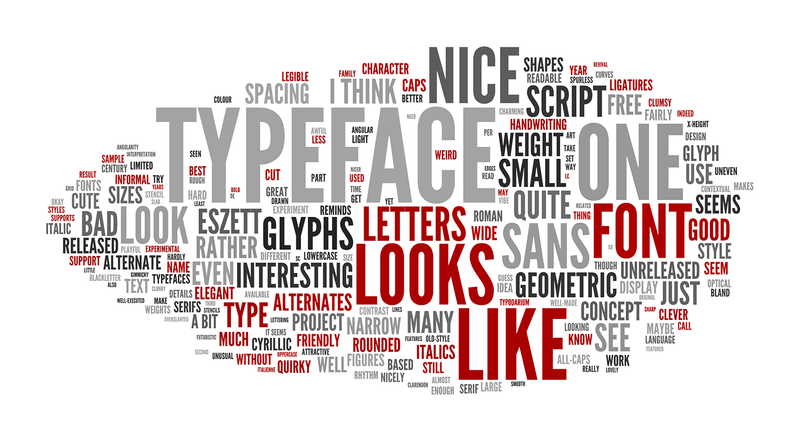 But how do you describe typefaces? The two large red words in the bottom half – ‘looks like’ – tell you how I did it: by comparing them to (older) typefaces the reader hopefully knew. There are other terms in my tweets that are merely descriptive rather than evaluative: One of them is ‘unreleased’. We have seen before that well over a third of the typefaces in the 2015 Typodarium were unreleased, but the medium size of the word suggests that I did not mention this in every case. You can also see that I used ‘weight(s)’ a lot more than I used ‘italic(s)’: This does not necessarily indicate that emphasis by means of stroke thickness is (becoming) more important than emphasis by means of slant, but may simply be due to the fact that the calendar features many typefaces that can have weights (such as script typefaces or various experimental stuff), but that are not necessarily accompanied by an italic cut. The most frequent evaluative terms in the cloud are ‘nice’ and ‘interesting’. Both words are often used sarcastically, but that is not what I did in my tweets. The high frequency of these two words is rather the result of an observation that you can, luckily, make in a number of contexts: Many things are nice, that is, ‘pleasant’, ‘​enjoyable’ or at least ‘​satisfactory’ (as the dictionary says) or mildly interesting. Few typefaces in the Typodarium were egregiously ‘bad’ (smaller on the left-hand side), few were phenomenally ‘great’ (much smaller between the ‘P’ and ‘E’ of ‘typeface’). Most were okay. That is disappointing or reassuring – depending on how you look at it. One more thing we see in the word cloud: Terms like ‘quite’, ‘rather’ and ‘fairly’ are frequent; ‘I think’ also is. In my view, that is a good thing. There is no downside to adding such qualifiers (well, maybe there is when you only have 140 characters available, but as you saw, it still worked out). The upside is that they help highlight the relativity and subjectivity of judgements, reminding the reader that I may very well be wrong, too. These qualifiers reflect that I tried to be frank without being rude and clear without being apodictic. I hope I occasionally was. Last not least, the cloud tells you about topics in type that I care about. A large word is ‘small’, reflecting the fact that I am interested in text typefaces and in how typefaces perform in text. ‘Sizes’ on the left-hand side also belongs to this topic: In the last ten years or so, ‘size-specific adjustments to type designs’ (that is the title of a book I admittedly still have not read) have seen some renewed popularity. The same cut of a typeface is unlikely to read equally well and look equally good at 7 pt and 72 pt; it is good to see an increasing number of type designers take this into account. By contrast, I was disappointed to see few typefaces that support Greek or Arabic (or any non-Latin writing system, for that matter) in the 2015 Typodarium. The medium size of ‘Cyrillic’ in the cloud shows that, whenever (decent) non-Latin typefaces were featured, I took note. The last topic I mentioned in a fair share of tweets is closer to home for me: Eszett. The only letter that is exclusive to the German language proves difficult to get right for type designers from anywhere outside the area where you can encounter it in everyday life. The recent (re)introduction of a uppercase equivalent, ẞ, adds to the problem.